One of the reunion organizers, Jean Shepherd stated that the Class of 1971 had what many people said was among the best, if not THE best, reunion ever. 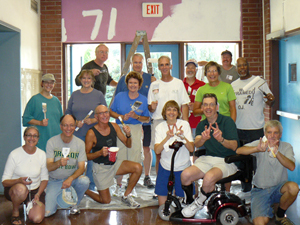 In September 2011, they partied for two days, but still managed to have a Sunday work project at Woody High (September 11, 2011). Shots from the setup on Saturday afternoon, and more shots from O’Connors on Sunday Afternoon: http://photobucket.com/afternoons. Check out p. 12 of the October SW Neighborhood Association newsletter for a story about their service project at Wilson: http://newspaper.swni.org/2011/October_2011.pdf.